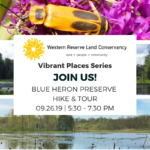 Experience the Land Conservancy’s work first hand by hiking new trails, connecting with family farmers, and exploring cherished keystone properties during our 2019 Vibrant Places series. 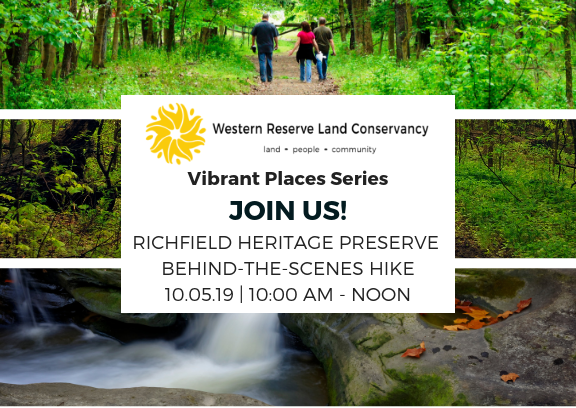 Please join Western Reserve Land Conservancy for a behind-the-scenes hike of Richfield Heritage Preserve! The creation and permanent protection of the Crowell Hilaka Recreation Area is a story of perseverance, passion, strategy and community conservation. Originally purchased and farmed by the Oviatt family in 1831, inventor James B. Kirby bought the property in 1919. He built his estate on the 336-acre parcel which included a mill and waterwheel that generated electric power for his lab and workshop; a house that was originally air conditioned by diverting spring water to flow over its roof; and a hall that was built on enormous trolley springs which bounced as people danced. Kirby sold the land to the Cleveland Girl Scouts in 1937. For more than 70 years, thousands of girls camped at Crowell Hilaka and enjoyed the property’s two lakes, several headwater streams, mature forest, wetlands and miles of hiking trails. Western Reserve Land Conservancy worked for years with community members to acquire and permanently conserve this historically- and ecologically-significant property. All celebrated success with the opening of Richfield Heritage Preserve in 2015! Please wear warm & comfortable clothing that you do not mind getting wet or dirty. Close-toed shoes are recommended. Hikers are encouraged to bring: bug spray, sunscreen, reusable water bottles, hats, and sunglasses. Parking: Ample parking is available onsite. Food and drinks will be provided following the hike. Registration is limited to 40 people. Please register below to reserve your spot. Join us for a hike at the beautiful Blue Heron Preserve!